Welcome to The Safety Centre. We are leading suppliers for 7Ah Battery units based in the UK. These are 12V sealed lead acid batteries which are commonly used in applications such as Fire and Security systems all around the world. Within our website we feature several different 7Ah Battery versions from manufacturers such as Yuasa, Enersys and Powersonic. These include the Yuasa NP7-12, Yuasa Yucel Y7-12, Powersonic PS1270 and Enersys NP7-12. All these batteries are 7Ah 12 volt units from some of the worlds top battery manufacturers. All these units feature a similar footprint and are ideal for standby power use. For example when they are used in a fire alarm system, the control panel is continually keeping the battery charged. This is so that in the event of a mains failure the panel can switch over to battery power to allow the panel to continue operating correctly. 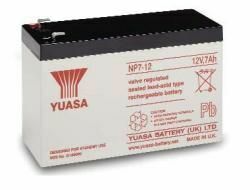 The NP7-12 is one of the most popular 7Ah battery units in their range. It is part of the NP range of standby power batteries which have a great reputation for reliable, high performance batteries. They feature the distincive black top with grey bottom and red logo. It is available in 3 versions as follows; NP7-12 with standard terminals; NP7-12L with wide terminals and NP7-12FR which features a flame retardent casing. The Powersonic PS1270 is instantly recognisable with its attractive blue and grey colour scheme. This device is manufactured by Powersonic and is used by many trade professionals throughout the United Kingdom. There are two versions available with a standard cell and a flame retardent version. They come supplied with plastic terminal protectors which help to reduce the chances of anything shorting out the terminals. The Enersys NP7-12 is similar in appearence to the Yuasa versions. They feature the same battery dimensions and are also suitable for providing a standby battery backup power source. Enersys are a popular manufacturer of batteries in the UK. They are specialist manufacturers for automotive and industrial use. Many of their industrial standby power batteries and also Odyssey automotive batteries are featured within our website. In addition to their NP range, Yuasa also have their impressive Yuasa Yucel range. This range of batteries have a Y prefix infront of them instead of the NP prefix. They are extremely popular with security professionals as they provide a high quality battery with a proven track record at a low price. For more information on these products call our experts NOW on 01200 428 410 or use our Live Chat facility which can be found below.